Humans routinely assess thinking – their own thinking, and that of others, and yet they don’t necessarily use standards for thought that are reasonable, rational, sound. To think well, people need to routinely meet intellectual standards, standards of clarity, precision, accuracy, relevance, depth, logic, and so forth. In this guide, we offer a brief analysis of some of the most important intellectual standards in the English language. We look at their opposites. We argue for their contextualization within subjects and disciplines. And, we call attention to the forces that undermine their skilled use in thinking well. Please see below for a review on this guide, and more information. The mind doesn’t naturally grasp the truth. We don’t naturally see things as they are. We don’t automatically sense what is reasonable and what unreasonable. Our thought is often biased by our agendas, interests, and values. We typically see things as we want to. We twist reality to fit our preconceived ideas. Distorting reality is common in human life. It is a phenomenon to which we all, unfortunately, fall prey. We need a system for intellectual intervention, a method for pre-empting bad thinking. We need to take rational command of our cognitive processes in order to rationally determine what to accept and what to reject. In short, we need standards for thought, standards that guide us to consistently excellent thinking – standards we can count on to keep our thinking on track, to help us mirror in our minds what is happening in reality, to reveal the truth in situations, to enable us to determine how best to live our lives. Our goal in this guide is to provide a conscious foundation for thinking about intellectual standards, and the words that name them. Ultimately, such consciousness will enable those proficient in the use of intellectual standard words to think more effectively in every domain and subject in which, or about which, they think. Of course, in this brief space, we can provide merely the beginnings of a systematic analysis of standards for thought. In doing so, we open the door to the development of a broad and integrated view of intellectual standards. We offer a brief analysis of some of the most important intellectual standards in the English language. We look at their opposites. We argue for their contextualization within subjects and disciplines. And, we call attention to the forces that undermine their skilled use in thinking well. When humans, as a species, begin to take seriously the important role of intellectual standards in the development of rational human cultures, when people understand the idea of intellectual standards in connection with a rich conception of critical thinking, when we commit ourselves to using intellectual standard words, explicitly and routinely in everyday life, we will begin to create critical societies. We will begin to bring into being ways of living in a world which further the values and skills of fairminded critical thinking. 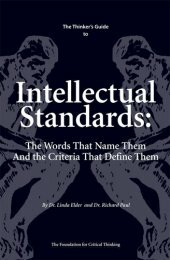 The Thinker’s Guide to Intellectual Standards: The Words That Name Them and the Criteria That Define Them (Thinker’s Guide) is an unusual work. When I first started reading this pamphlet, I wondered what relevance it might have to competitive intelligence. When I was done, it reminded me of a small book I had to read my first year in law school, Maitland’s Forms of Action at Common Law. This was a series of lectures, first published in 1909, detailing the way that English common law developed the concept of accessing the state for justice. At first, I did not understand why such ancient history was relevant to modern law. But, by the time I graduated, I found that knowing the intellectual and historical roots of our common law made my understanding of the present more complete and deeper. The same is true of Thinker’s Guide. At one level, it is a teachers guide to learning about and then teaching critical thinking, or as we in competitive intelligence sometimes call it, analysis. At another level, it is an indictment of sloppy thinking, supported by or concealed by sloppy language. It reminds us that, as one radio commentator has said more than once, “words mean things”. I believe that anyone who teaches any aspect of CI should work his/her way through this book at least once. You will learn why precision is what you say, and what your students say, is critical to developing effective analytical, and how to communicate that message. It also serves as a reminder of how our own perspectives/biases/blind spots impair our own effective thinking and communication.